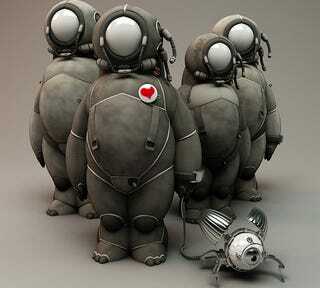 Olivier Bucheron aka Zamak has a delightful imagination for marshmallowy aliens and puffy robots of the future. His creature have lanky arms and adorable little faces, and some are so cute you know they just have to be deadly. Check out the full gallery of his creations, including a robo-gorilla. Everywhere, any details. It’s always hard to know why something pops up in your mind. Sci-fi cinema and fantasy in general [are an influence on me]. I’m not a big fan of manga, but I keep having a look at it, Ghost in the Shell, Dragon Ball Z, others. Also, the Internet and [the] artist portfolios [of] Michael Kutsche, Ashley Wood, Daniel Simon, 1st Ave Machine, and Michelin‘s [mascot].